Two methods of earning high school credits! High school courses in a traditional, adult-centered classroom and/or online high school diploma self-paced courses centered in an iMac lab where students work at their own pace under the direction of a teacher. Academic counselors who provide individualized evaluation of students' transcripts from schools both inside and outside of the United States as well as provide academic counseling and guidance about completion of the high school diploma. 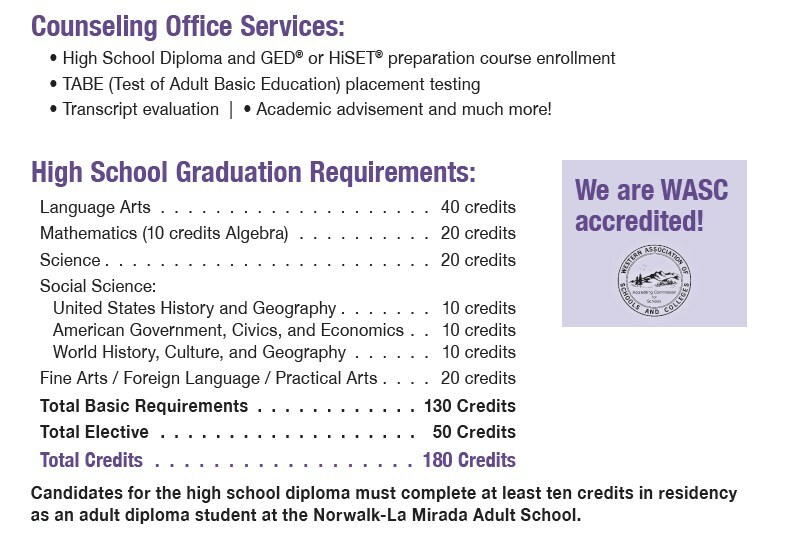 The Norwalk-La Mirada Adult School is an official GED and HiSET Testing Center and offers test preparation for both exams. 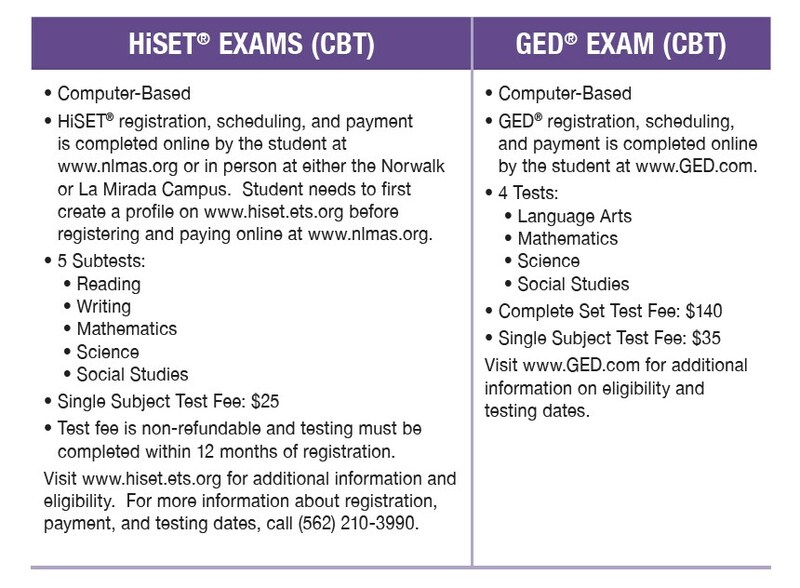 If you are interested in the GED test, log onto www.ged.com - the official site for the GED test. This website will give you full details about registering to take the 4 subject tests (Language Arts, Science, Social Studies, and Math) that are covered on the GED. Each subject test is $35 and must be purchased through the ged.com website. If you are interested in GED test preparation, we offer morning or evening preparation sessions for $25 per semester. This includes the most current GED preparation textboks, online resources, and fully credentialed teachers who are well-versed in the GED exam to assist with preparation. This fee also includes official GED practice tests for each of the subject areas, with teacher analysis of practice test scores. If you are interested in the HiSET test, visit www.hiset.ets.org for more information and to create a profile. There are 5 subtests (Reading, Writing, Mathematics, Science, and Social Studies) that are covered on the HiSET. The fee for each single subject test is $25 at our agency. HiSET test preparation is also available morning or evenings for $25 per semester. Our academic counselors will assist individuals who have questions about preparing for the GED or HiSET exam. Call (562) 210-3990 for academic counseling hours.